Your small-group tour, limited to 15 participants to allow for a more personalized experience, begins with a pickup at selected hotels or in front of the Parc 55 Hotel. Heading across the San Francisco Bay Bridge by minivan, take in the views of San Francisco, Alcatraz, and the Golden Gate Bridge. Continuing on through the San Joaquin Valley, you're driven past fruit and nut orchards. After making a quick stop for snacks, you'll arrive in the Sierra Nevada foothills and California Gold Country. Entering Yosemite National Park via historical Groveland, spend time (weather conditions permitting) walking among Yosemite’s giant sequoias — the largest of these ancient redwood trees spans more than 40 feet (12 meters) in diameter at its base and lives to at least 3,000 years old. 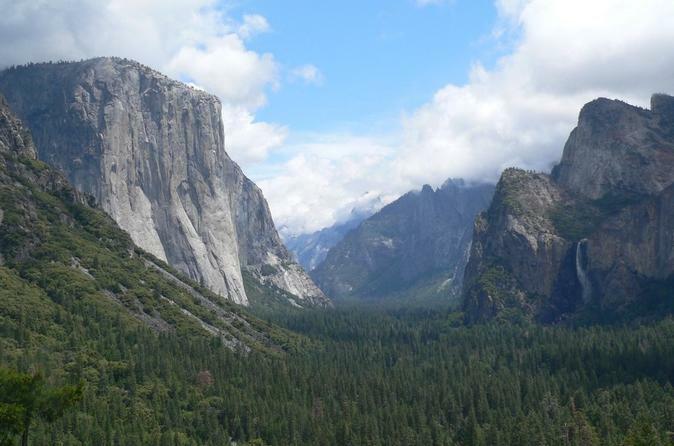 After the 1-mile hike, it's onward to Yosemite Valley via Tunnel View, a vista point that includes views of Bridalveil Fall, El Capitan, and Half Dome. From here it's a short drive to these sights. Marvel at 'El Cap,' considered the world's largest exposed piece of granite, which rises 4,000 feet (1,219 meters) above the valley floor. Search for rock climbers ascending the vertical wall before gazing up at nearby Half Dome and Yosemite Falls. Spend your free time for lunch (own expense), hike along nature trails, relax at the base of Yosemite Falls, or visit Yosemite Village. The return journey includes another snack stop in the Central Valley before your 14-hour tour ends with hotel drop-off in San Francisco.